Why are some neighborhoods covered in litter? Photo: Streetsblog. A few weeks ago, I found an apartment in the Outer Mission. It had a view of Twin Peaks, plenty of room, and it was in my price range. It is a short bike ride to the great transportation links at Balboa Park Station. It also was a half-block from a stop on the 14-Mission bus. There’s a nice cafe down the street, a couple of small markets within a few blocks, and pretty much everything a Livable Streets advocate could ask for, except for bike lanes, but hopefully those will come. As I negotiated with the owner, I started hanging out in the area as much as possible, to see how I liked it. Almost right away, I noticed a lack of pedestrian traffic. Despite Lincoln Park and the Cayuga Playground, both a few blocks away, a large supermarket on Alemany, and some nice restaurants, and a fair amount of car traffic, I saw virtually nobody out walking. And there was a whole lot of trash. At first I thought it was because of the powerful winds that came through a few days prior; perhaps they had blown over some trash cans. But the litter stayed. Nobody swept up in front of their shops. As I explored further, I noticed even more trash. What struck me even more was the stark contrast with the neighborhoods on the other side of I-280. Less than two miles to the west I could find litter if I looked for it, but I wasn’t tripping over it. On the weekends, I saw people outside cleaning up their front yards and sidewalks with rakes and brooms. Same with graffiti: to the west of I-280, it’s there, but harder to find. East of I-280, it’s pretty prominent. 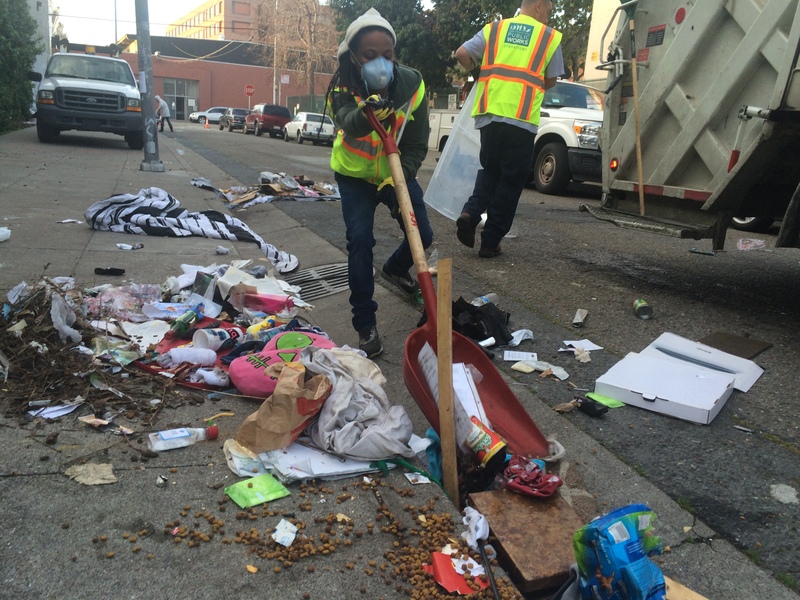 A study shows SF is getting cleaner, but SFDPW still has its work cut out for them. Photo: From the SFDPW’s Website. Business owners approached the team during the site analysis to inform them that they took responsibility for cleaning the sidewalks and streets near their places of business. Overall, the sites were cleaner in 2014 than they were in 2009. We partner with property owners to maintain the highest standards of cleanliness along San Francisco’s busiest neighborhoods and commercial corridors to keep them safe, beautiful and inviting. Our staff are out on the streets, sometimes before the sun rises, to inspect rights of way, enforce codes and educate merchants and residents about City codes. So is the problem simply that on some blocks people don’t care–or don’t know how to contact the city and get things cleaned up? Is this a squeaky-wheel-gets-the-grease kind of situation, and in some areas, there’s just nobody squeaking, to play out the metaphor? 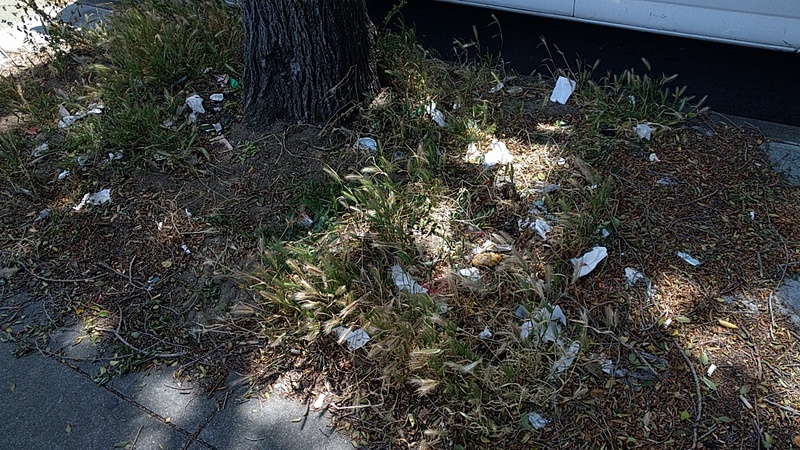 Rachel Gordon, a spokeswoman for the San Francisco Public Works Department, said there’s a host of reasons for why one neighborhood will get littered and another stays clean. “Sometimes it’s just the wind, but other times it’s how much traffic the area gets.” Drivers, she says, tend to throw things out windows. But pedestrian traffic can result in more litter too, especially in areas with a large number of Single Room Occupancy dwellings (SROs). She identified the Tenderloin as an area they have to clean up frequently. The department has about 80 people from the Department of Human Services that they send out with “sweep up crews” to collect litter. That said, it’s legally the responsibility of business owners and residents. “You have a responsibility to keep your property and sidewalk free of litter and bird droppings, dog poop, everything–it’s your responsibility to clean,” Gordon said. She also said there’s a contagion effect: if residents and business owners clean up, visitors are less likely to litter. But if people in an area say, “That’s not my garbage, I’m not picking it up,” then they invite more littering. “You want to take pride in your neighborhood; if the street is clean and you keep things maintained then people are more likely to take care,” said Gordon. The Adopt-A-Street Program is a partnership between the City and its merchants and residents. Groups or individuals agree to adopt an area and take responsibility for keeping the street, sidewalk, and storm drain clean. In return, we provide free street cleaning supplies, and litter and compostable leaf bag pickup. 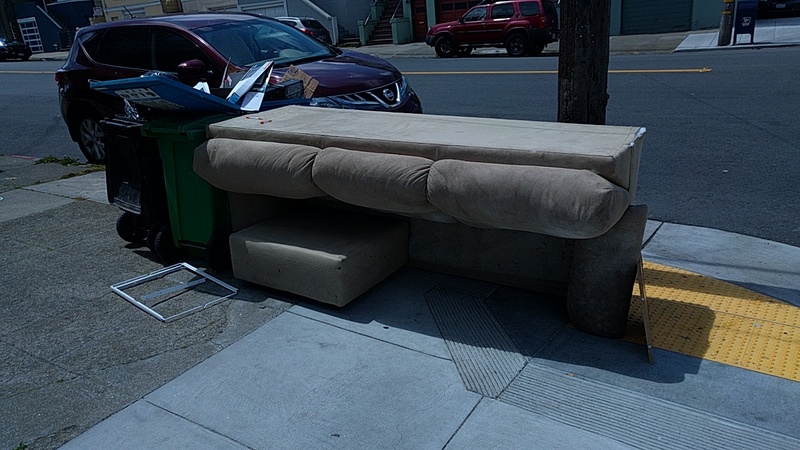 Discarded trash and sofas remains uncollected for way too long in some neighborhoods. Photo: Streetsblog. 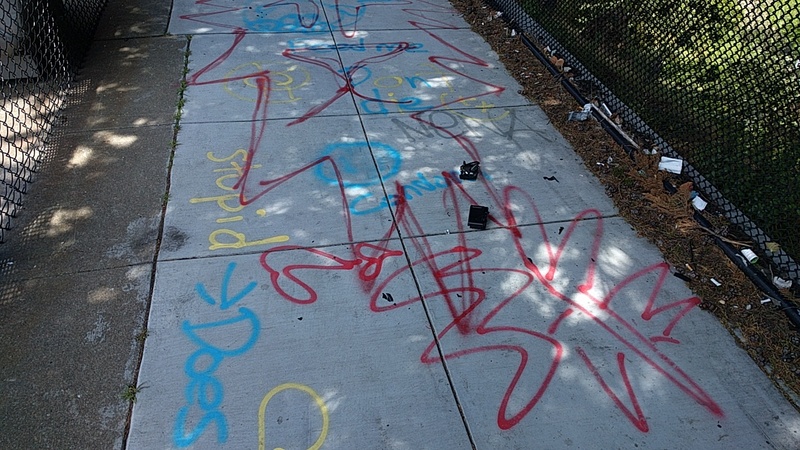 Graffiti and litter near the Cayuga Playground. Why are some neighborhoods blighted? Image: Streetsblog. you can visit 311 online, use the mobile SF311 app or call 311. Our goal is to remove waste that is our responsibility within 48 hours during week days. An action plan will be developed for projects that require more than 48 hours to address. Before you call, please determine the street address and the nearest cross-street where the waste is located. Meanwhile, it was a tough decision about the apartment. I thought about taking it and trying to organize one of the city’s clean-up teams. But the owner was honest and said litter’s been an ongoing problem. As he said, “If you’re a guy who likes to walk and ride a bike, maybe this area is not so good for you.” Gordon, meanwhile, said she is going to try and get some clean up crews out to the block. Do you live or work in an area that’s heavily littered? What do you think is the root cause? How does it relate to livable streets? And what have you done, if anything, to try and fix the problem? By Lincoln Park, do you mean McLaren Park? Some streets in my neighborhood (Nob Hill) are quite littered. Part of the reason is that there is no street sweeping to speak of. Example blocks are on Larkin between Pacific and Sacramento, and Pacific between Larkin to Jones. I was told by someone who used to be on the MPNA board that when they requested sweeping on those streets, they learned that there were people who were against it because they didn’t want to move their cars. In this case, some people valued their cars over how clean their neighborhood is. We moved to the Bayview last year and there are lots of problems with littering and illegal dumping. There is one house on our block that constantly leaves bags of trash on the same corner, 2-3x a week. Of course animals get into it and it blows everywhere. I clean up around our place almost daily and have complained numerous times to 311 but they never do anything about it. Many people in SF have lobbied to have street sweeping reduced to once every two weeks, but I haven’t heard of them getting rid of it entirely. Google street view suggests that the sweeping does not exist on Larkin north of Clay, and that has been the case since 2008 at least. Very interesting. I sweep the sidewalk in front of my house and pick up the random (sometimes bizarre) stuff that appears regularly. In my observation, over a period of twenty years, there is somewhat less litter than there used to be. Fewer Muni transfers. Fewer cigarette butts (but still some.) Every once in a while fast food trash. (Hard to understand–there are no fast food outlets within a mile of my home.) Fewer dog feces these days, thankfully. In my opinion, if Harvey Milk had never done anything in his life beyond the Pooper Scooper Law, he would still deserve sainthood. I grew up in the neighborhood (born 1993) and do not recall of any street sweeping occurring on any of the streets that I talked about at any point in my life. Street sweeping mostly only sweeps the gutter though, not the sidewalk, which is where I tend to notice the most litter. DPW crews do targeted hand sweeping on sidewalks (and they have special sidewalk sweeping machines along Market, where you never know what you’re going to find), but cleaning up litter on sidewalks is primarily the responsibility of property owners. In any event, this is apartment-hunting in San Francisco. If you find a place that meets all your criteria, litter alone is a bad reason to reject it. There’s a small park, also called “Lincoln Park,” between Templeton and Acton, just southeast of Mission. Bingo. The apartment hunter is referring to a border sector that ranges from Cayuga (S.F.) to Lincoln Park (Daly City). The supermarket on Alemany (cross street Farragut) is the Pacific Super, Asian in emphasis, decent prices, and they had a hot food counter near the south exit in the past (been a couple of years since my last visit). The problem, as I recall it, was partly the freeway, partly the border, and some homeless / car campers. One bad spot was near the 7-11 at Alemany and San Jose. Parts of Alemany from San Jose north to the Safeway (near Onondaga) were dead zones with some illegal dumping. The foot traffic tended to avoid Alemany because it was a ‘stroad’. Plus, Mission Street was close by and more interesting. That’s right on the way up to San Bruno Mountain if that interests you. Got it, good to know! Didn’t know that park existed. In Oakland, the biggest problem areas I’ve seen are near homeless encampments, clothing donation boxes, parks, and overfull city trash cans. This indicates to me that it’s an organizational problem on the city’s part more than anything else. Empty the trash cans on time so people have a place to throw their trash; fine collection box owners for bags left outside boxes; send cleanup crews with police escorts to remove the mounds of accumulated & dumped trash at homeless encampments. As far as composition of the trash, tobacco litter is far and away the culprit: cigarette butts, plastic cigar mouthpieces, cellophane cigar wrapping. The staggering volume of these products makes me marvel at the utter lack of regulation. If the cities, counties, state, and manufacturers all know (and they do) that these items comprise the bulk of litter items, why do we permit the sale of items we know will clog our drains, pollute our waterways, and leach toxins into the water & soil? Since the companies have shown no corporate responsibility on the issues, I would guess it’s well within a city’s rights to pass an ordinance banning the sale of products that all parties understand to impose significant maintenance problems & cost on city infrastructure & environment. I think that’s about the only action that could force manufacturers to finally take responsibility for their products’ end of life impacts. I wonder how the loss in tobacco-related sales taxes would weigh against savings in maintenance costs and environmental remediation? I live in the Outer Mission. It’s amazing the amount of dumping and graffiti along Alemany, in and across from Cayuga park. This is even since the the park was remodeled. I cannot imagine what it was like before the remodel and the restrictions on parking RV’s along that stretch of road. I think folks are just lazy and they know, because of the way 311 and DPW cleans things up, they can get away with drive-by dumping and not get penalized. Even if we had security cameras the culprits would likely not get prosecuted. Neighborhood groups have worked hard to help clean things up but it’s an ongoing problem that has apparently has no solution. How many times can you volunteer to clean up someone else’s garbage before you just give up in frustration? We have a neighbor 2 doors down that smokes outside his house and flicks the cigarette butts onto the sidewalk. What is the thought process that makes someone consider that OK? It’s just a small bit of garbage? What’s the harm? Well, every house downwind of him is gifted with cigarette butts caught in their greenery, corners of their stairways, driveway doors… etc. One of these days I will pick up every piece of trash between my house and his and put it at the top of his stairs by his front door with a little bow on top of the pile. two days ago grey McLaren. P1 I bought after earning 18,512 Dollars..it was my previous month’s payout..just a little over.17k Dollars Last month..3-5 hours job a day…with weekly payouts..it’s realy the simplest. job I have ever Do.. I Joined This 7 months. ago. and now making over hourly. 87 Dollars…Learn. More right Here !tr205u:➽:➽:.➽.➽.➽.➽ http://GlobalSuperJobsReportsEmploymentsLightGetPay$98Hour…. .★★★★★★★★★★★★★★★★★★★★★★★★★★★★★★★★★★★★★★★★★★★★★★★★★★★★::::::!tr205o….,…. Upper Manhattan has similar problems. A combination of bad behavior and subpar city services, yes, but more importantly a lack of anyone bothering to clean it up. If the building supers, janitors and businessmen turn a blind eye then it becomes socially acceptable. Very frustrating. I am a member of WALC, the Westside Anti-Litter Club. We do WALC walks with cute little yellow vests. It is obvious that the area near the Irving commercial corridor (Central Sunset) is buried in trash resulting from the merchants who don’t do enough to clean up the surrounding streets. Lots of chicken bones from KFC, hot sauce packets from Taco Bell, boba tea cups and straws, cigarette butts, alcohol bottles, etc. Actually we have sort of a perfect storm, because we also have lot’s of dumping from transient residents, trash from homeless, and residents who support the reduction in street sweeping so that they don’t have to move their cars as often. Along 19th Ave (Highway 1) we also have lots of trash from passing cars. We have an industrial scale trash problem over here, and us volunteers alone can’t keep up. We have one DPW person (Sue) who picks up trash along Irving, but she doesn’t do the side streets. There is limited funding for her position. I would like to see the merchants step up and fund some side street cleaning. We definitely need it. This is a peculiarity American problem. We were just in BC Canada and while we saw some litter when we stopped our car at the side of the road, it wasn’t as much as on the American side of the boarder. The moment we crossed back into the US, roadside litter was everywhere. Disgusting. I think Canadians take greater pride in place, we need to do the same.